Used when the depth of the product is not very tall. Shipped flat and must be stapled together. 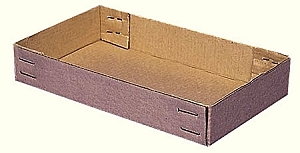 Custom corrugated trays can be manufactured using a variety of flutes. We can manufacture custom trays to fit your specfic requirements. Call us today to discuss.